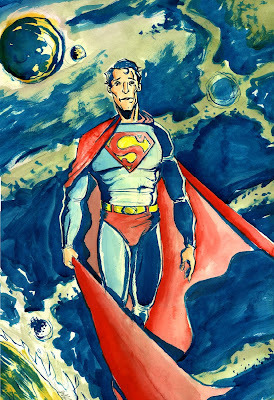 The following painting is currently being auctioned on ebay along with a bunch of others as part of a fundraising effort for the Joe Shuster Awards. Details below from the Joe Shuster Commitee. Back in June we had a number of different artists submit their version of the Man of Steel in honour of his 70th birthday and to honour his co-creator, Joe Shuster, for whom the Joe Shuster Canadian Comic Book Creator Awards have been named. 42 pieces were submitted, and were displayed twice as an art exhibit - once on June 14th on the date of the presentation of the 4th Annual Joe Shuster Awards, and again in early November as part of the Speakeasy Comic Art show in Toronto. Starting tonight, we will begin auctioning off the pieces on eBay as part of our fundraising efforts for the 2009 Awards. Except for three pieces, all of the initial offerings are no reserve auctions, with a starting price of $49.99. We'll be doing some more next week as well. Please note: We have set reserves for the Sim, McFarlane and Grummett contributions that we feel are fair for pieces of this quality. Please take a look, and hopefully something there will catch your eye. All monies raised from the sale of these pieces, after fees are paid, goes towards next year's awards. I will be selling these under my own eBay userid "kevthemev" instead of the low feedback "joe_shuster_awards" id. Auctions start at 8PM EST (both nights) and finish before 9PM EST.